UPDATE: The driver has been found, but police have not decided whether or not he will be ticketed. Get the full story at News On 6 here. Sapulpa Police are still looking for a truck that they say caused an accident off of New Sapulpa Road earlier this month. In a coversation with Sapulpa Times earlier this week, Sapulpa Police said the accident occured when a white truck with a flatbed trailer on the back tried to change lanes while driving northbound on New Sapulpa Road. The driver of the red SUV—we’re told is a grandmother, was forced into the center turning lane in order to avoid a collision. 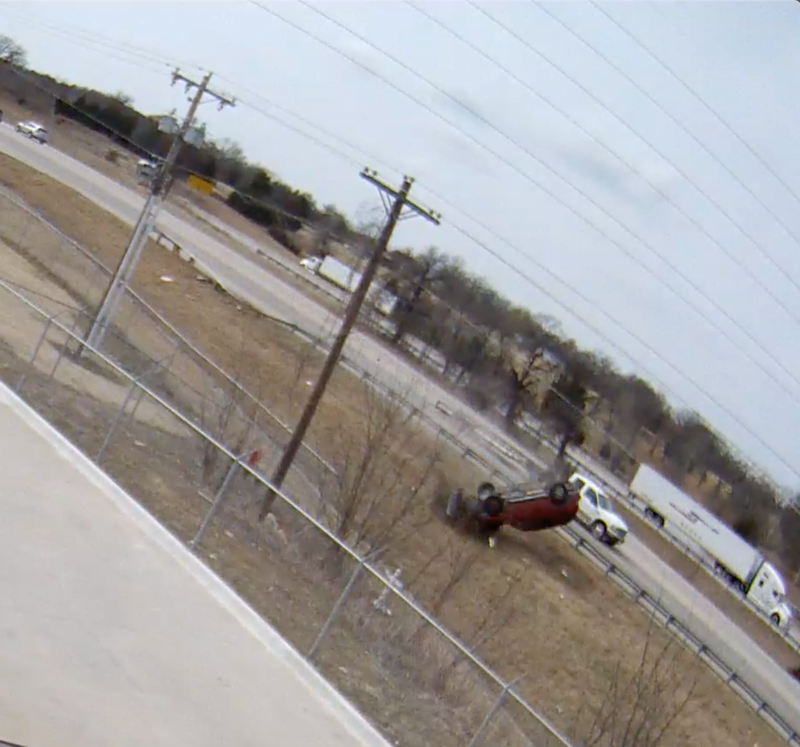 According to video of the accident, caught on outside security cameras of a business adjacent to that stretch of the highway, it doesn’t appear an actual collision occured, but the driver of the SUV began to swerve sideways, and eventually left the highway, crashed through the guardrail, and tumbled nearly end over end several times before coming to a rest near the bottom of the ditch. The white truck—that police are currently hoping someone will help them identify—kept driving. According to Sapulpa Police, the occupants of the red SUV were a grandmother, who was secured with a seatbelt, and a little boy, believed to be her grandson. The boy was in a car seat, but we’re told he had unbuckled himself prior to the accident. He was ejected out the back window of the vehicle, but miraculously survived, suffering only a broken arm. The woman suffered only a few bumps and bruises. Both are lucky to be alive. The other vehicle appears to be a white late-model Chevrolet or Ford pickup with a flatbed in the back and an additional flatbed trailer attached. Police are actively searching for this vehicle. You can see live video footage of the accident, including the aftermath, in the video, which we’ve included below. We’ll keep you updated as this story continues to develop. ← Nerd Knowledge: How does GPS even work?